The Materials Economy is a production system that dominates our manufacturing world. It is a system that starts with the extraction of raw materials from the ground and their processing into usable materials. This is followed by the refined materials being used to manufacture products in factories (called production). The next two stages are the distribution of products to retail outlets, or direct to the consumer (consumption). The last stage, at the end of the products useful life, is disposal. This elementary way of describing the Materials Economy, reveals a simple but important flaw with the system. We live on a planet that has finite resources and those resources that are not renewable, will eventually run out. The linear system called the ‘Materials Economy’, is unsustainable. The ‘Materials Economy’ has major affects on people and the environment. People are employed in every stage of the materials economy. The system employs billions of people, from the extraction of raw materials from the ground, to retailers, who are trying to sell us an endless variety of products. We are all consumers and whether we like it or not, most of us indirectly / directly have a negative impact on the world around us. The more products we buy, the greater the negative impact on the environment. The products we buy, cause pollution and environmental damage, when being manufactured and often when being used (due to their energy needs). In terms of our live style, the linear system ensures that we work long days and in our free time we are consumers, buying the products manufactured as a result of the Materials Economy. We are bombarded by advertising, that encourages us to buy more and more products. Furthermore, due to globalisation, many products are manufactured in countries, with governments that are not particularly concerned about the well-being of their workers, their working conditions or wellbeing. The environment is damaged by the Materials Economy. The extraction of raw materials from the ground, damages the environment and causes pollution and physical scars on our planted. The manufacturing processes create further environmental damage, in the form of atmospheric pollution. The dumping of waste materials and the use of energy produced by fossil fuels, also contribute to environmental damage. The distribution of products, releases CO2 gases into the atmosphere, as lorries, ships and planes burn the fossil fuels, required to transport the products, from the factory to the retailer and then to the customer. Many products use energy or need recharging, indirectly creating pollution and environmental damage. WHAT COULD REPLACE THE MATERIALS ECONOMY? A production system based on the environment being the priority. All products are designed to be environmentally friendly and completely recyclable. 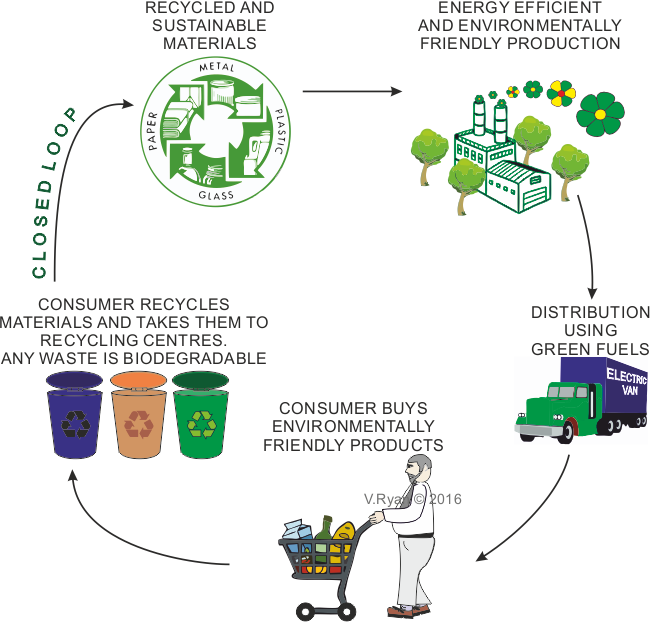 A ‘closed loop system’ of recycling and the use of sustainable materials, with any waste produced being biodegradable. The fuels used to power homes and industry are renewable and sustainable. An educated consumer, consuming fewer products and energy and taking care to recycling all materials. A distribution / transport system based on renewable fuels, such as hydrogen or electricity (produced by wind, sea, solar and biomass). Local manufacturing rather than remote manufacture, dramatically reducing our carbon footprint / pollution. A system totally focussed on the long term sustainability for our planet.